You are currently browsing the tag archive for the ‘creation’ tag. In Issue 38 of the Baba Indaba Children’s Stories, Baba Indaba narrates the Mixtec story of creation and the flood. The Mixtecs were the ancestors of the Mexicans. Baba tells the story of how the gods lived in peace and harmony at Apoala, which translates as “Place where the Heavens Stood” and how their sons, named Wind-Nine-Snake (Viento de Neuve Culebras) and Wind-Nine-Cave (Viento de Neuve Cavernas) prayed for land to appear. In Issue 34 of the Baba Indaba Children’s Stories, Baba Indaba narrates the Maya version of the creation story which starts with the high god Hurakan, the mighty wind, who passed over the universe, still wrapped in gloom. He called out “Earth”, and the solid land appeared thus starting the creation of the world. Alíksai! A very long time ago there was nothing here in the world but water. Only away off in the west where Hurúing Wuhti lived there was a small piece of land where she lived. She lived in a hill or bluff called Taláschomo. Hurúing Wuhti owned the moon, the stars, 2 and all the hard substances, such as beads, corals, shells, etc. Away in the east lived the Sun, painted up very beautifully. The Sun was very skillful. One time Hurúing Wuhti sent the Moon to the Sun, throwing him through (the intervening) space so that he fell down in front of the Sun. He told the Sun that Hurúing Wuhti wanted him; then he arose and passed through the sky back to the west. The Sun also soon rose and followed the Moon to the west, to the house of Hurúing Wuhti. “Have you come?” the latter said. “Yes, I have come. Why do you want me? I have come because you wanted me.” “Thanks,” the Hurúing Wuhti said, “thanks that you have come, my father, because you shall be my father.” “Yes,” the Sun said, “and you shall be my mother, and we shall own all things together.” “Yes,” Hurúing Wuhti said, “now let us create something for you.” “All right, thank you,” the Sun replied. Hereupon they entered another chamber which was very beautiful, and there all kinds of the skins of different kinds of animals and birds were hanging. So Hurúing Wuhti got out a bundle and placed it on the floor. It was a large piece of old native cloth (möchápu). She then placed on the floor all kinds of bird skins and feathers. Hereupon she rubbed her body and arms, rubbing off a great many small scales from her cuticle. These she took into her hands, rubbing the two palms of her hands together, and then placing these small scales on the feathers and skins. Hereupon she covered the whole with the möchápu. The Sun kindled a little fire at the east side of the pile. Hurúing Wuhti then took hold of two corners of the cloth and began to sing, moving the corners to the time of her singing. The Sun took hold of the other two corners and also waved them, but he did not sing. After they had waved the corners four times, the things under the covering commenced to move, and soon they began to emit sounds, whistling and chirping the way the different birds do. Hereupon Hurúing Wuhti took off the covering saying: “We are done, be it this way.” There were all different kinds of birds, those that fly around in the summer when it is warm. As she took off the covering the birds commenced to fly, passed through the opening and flew out into the air, but soon all returned, gathering again in front of the two. “You shall own these,” Hurúing Wuhti said to the Sun, “they are yours.” “Thanks,” the Sun replied, “that they are mine.” Hurúing Wuhti then handed to the Sun a large jar made of a light transparent material like quartz crystal. Into this the Sun placed all the birds, closing up the jar. Hereupon the Sun said: “Now, let us create something for you, too.” “Very well,” Hurúing Wuhti said. Then the Sun placed a small quantity of different kinds of hair on the floor. Furthermore, a little quantity of the different kinds of paints that he was painted up with. He then let his beard (rays) drop upon these objects, also shook his wings towards them. They then covered up the things again, each took hold of two corners of the covering, and the Sun then sang a song. Soon something began to move under the covering, and when they removed the latter an antelope, deer, cotton-tail rabbit, jack-rabbit, and mountain sheep jumped up, and after running around in the large room for a while, they returned and assembled again in front of the two. “You take these, you shall own them,” the Sun said to Hurúing Wuhti. “All right, thank you,” the latter said. Hereupon these animals took places close to the Hurúing Wuhti, whom they considered as their mother afterwards. “You shall own these, they shall be yours,” the Sun said once more to Hurúing Wuhti, for which she thanked him. The latter then put the Sun into an opening in the floor of the house, through which the Sun departed with the vessel containing the birds. After having passed through the opening, the Sun returned under the earth to the east again, and when he came out he turned over the land which belonged to Hurúing Wuhti, and which had been under water, and by so doing made the world (tû’wakachi) land. The Sun at once noticed a great many beings come out of the water and moving. about on the shore of the land. He first called them the Water Lice (bá-atuhtu), but when he had risen to the middle of the sky he noticed that they were people, and he called them White People (Bahánas), some Spaniards (Castílians), and others Mormons (Mámona). He then poured out of the jar all the birds which then went flying around in the air and increased. From this time on the Sun always went towards the west, entering the house of Hurúing Wuhti, passing out below, and returning to the east again. When he came there this time Hurúing Wuhti said: “Have you come?” “Yes,” the Sun said. “Thanks,” the Hurúing Wuhti replied, “let us create something again. What have you found out?” “Yes,” the Sun said, “land has come out everywhere, and everything is beautiful, and the water is beautiful, too. Now, to-morrow when I shall rise there will be blossoms and flowers and grass all over the land. “Very well,” Hurúing Wuhti said, “but let us make something now again. What shall we make?” Hereupon she fed the Sun honey, and other good food. When the Sun was through eating, Hurúing Wuhti again said: “Well, now, what shall we make? Let us use the covering again,” placing the same covering that they had used upon the floor. Hereupon Hurúing Wuhti rubbed her legs and feet, rubbing off some more particles of cuticle. These she took into her hands, working them into a small ball, which she placed on the floor, and covered it up with the möchápu. They then again took hold of the four corners of the covering, Hurúing Wuhti singing a song. Soon something moved under the covering and the crying of a little child was heard, which soon said: “I am hot, am perspiring.” They uncovered it and found a little maiden. “O my!” Hurúing Wuhti said: “Only one has been created. That is not good, it must not be this way.” Hereupon she put on the covering again and, then repeated the song. Soon a second voice was heard, and removing the covering they found a little boy, the little brother of the mána. His first sound was a groan as that of a small child. Hereupon he also said: “I am very warm,” and wiped off the perspiration from his face and body. “Have you come?” Hurtling Wuhti said. “Yes, we have come. Thanks,” she replied. They were brother and sister. So the children sat up. “Have you anything to say?” Hurúing Wuhti asked them. “Yes,” they said, “why do you want us?” “Yes,” Hurúing Wuhti replied, “why my father, the Sun, has made a beautiful earth and I want you to live on this earth. That is why I want you. So I want you to go eastward now, and wherever you find a good piece of land, there you settle down. By and by others, too, shall come to you.” Before they started the Sun asked Hurúing Wuhti who these two were, how they should be called? And Hurúing Wuhti named the youth Múyingwa, and the maiden Yáhoya. Hereupon the two started and left. The Sun and Hurúing Wuhti prepared. to create some more. It was at this time still night. Hurúing Wuhti now rubbed her abdomen with both hands, and took from her umbilicus a small quantity of the scales which she twisted together. All this scaly matter, thus rubbed from her body, she then placed on the floor, covering it up with the aforesaid cloth. They again took hold of the corners, sang over it, and as they lifted up the corners the fourth time, something began to move under the covering. They took the covering off and there was another being all in perspiration. It was again a maiden. She wiped off the perspiration from her body with some sand that was on the floor, and sat up. Hurúing Wuhti told her not to rub her body any more, as the sand had already adhered to her body and the latter was dry. She hereupon told the maiden that she should be called Sand Clan member (Tuwá-wungwa), and Lizard Clan member (Kúkuts-wungwa). Hurúing Wuhti hereupon sent the maiden off after the other two, giving her, however, one grain of shelled corn before she left. By this time it became a little lighter and the Sun said to Hurúing Wuhti, she should hurry up. So the latter this time rubbed her face, and the inside of her nose, and from the scales thus rubbed off she formed a little ball, placed it on the floor, and again covered it. They went through the same process as before. 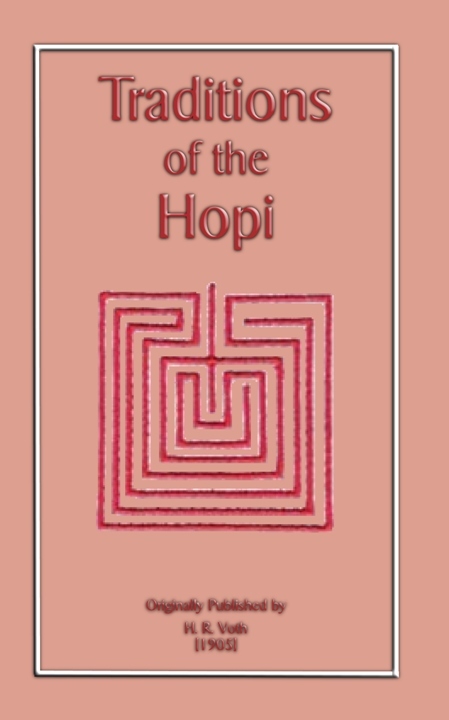 Soon they heard a child crying like a Hopi child would cry, and another one like the crying of a coyote. Removing the covering, they found a youth and a maiden, both also perspiring profusely and wiping off the perspiration. “Why do you want us?” the children asked. “Yes,” Hurúing Wuhti said, “we have made this beautiful world here and there is hardly anybody living there yet, and that you should live here somewhere we wanted you.” She then said that the mána should be a Burrowing Owl Clan member (Kókop-wungwa), and the youth coyote Clan member (Ísh-wungwa). Hereupon she gave one grain of shelled corn to each one and told them now to follow the others, and that they should travel quickly. Hereupon they created once more in the same manner as before. When they were ready to lift up the covering they heard somebody grunt, and another one seemed to be angry, so after they had partly lifted up the covering they dropped it again, but the two under it said, “Remove that, we are very hot.” So they removed it and there was one child like a Hopi. It was the one that had grunted like a bear. To this one Hurúing Wuhti gave the name Bear-Clan member (Hón-wungwa). She gave a grain of shelled corn to him and sent him on. The other, Head-with-the-Hair-Pushed-over-it-Backward (Tálqöto), was a Navaho, and to him Hurúing Wuhti gave a little piece of spoiled meat-and sent him on. This is the reason why the Navaho use meat, instead of corn like the Hopi. Hereupon the Sun again passed through the opening in the floor, returning to the east under the earth. The next day when he arose again and had traveled a distance, he saw in the distance smoke arising at different places, and noticed that the people who had been created were camping there. As he rose higher he saw at a distance a maiden and a youth who were traveling along, but seemed to be very tired. The maiden would sometimes carry her little brother on her back, then she would set him down and the two would join hands and travel along together. When the Sun came nearer he asked them: “Where do you come from? Who are you?” “Yes,” they said, “We have come out away off there somewhere.” “All right, the Sun said,” you travel on.” Hereupon he gave them water to drink and a little corn for food. He then said to the youth that he should be called Sun Clan member (Tawá-wungwa), and to the maiden he gave the name Forehead Clan member (Kál-wungwa), whereupon he told them to travel on east ward. 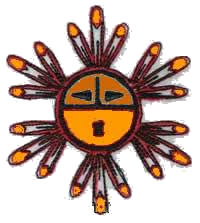 The Sun and Forehead clans later came to Shupaúlavi, the Bear Clan to Shongópavi, and the Burrowing Owl Clan to Mishóngnovi, while the Sand Clan went to Wálpi. Múyingwa and his sister settled down somewhere west of a large spring situated south of Shongópavi. 1 Told by Kúhkiuma (Shupaúlavi). 2 This is the only instance where the author heard of the moon and stars spoken of as being owned or controlled by Hurúing Wuhti. He did not know the songs mentioned in this tale.